Gorgeous photographs and meticulous watercolor images make this celebration of British Columbia’s diversity stunning in its artistry. 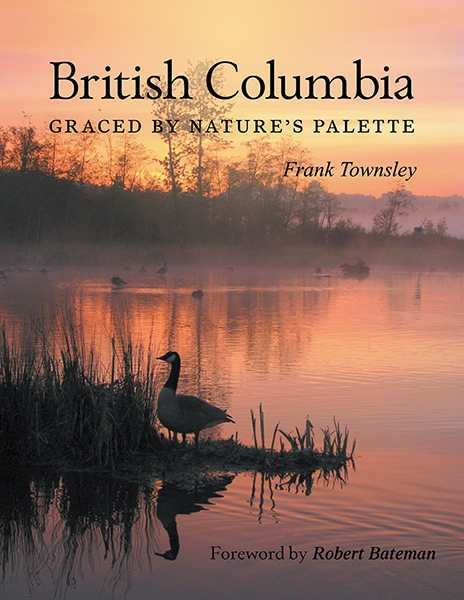 The Canadian province of British Columbia has the motto “Splendor without Diminishment.” That splendor is on full display in painter and photographer Frank Townsley’s British Columbia: Graced by Nature’s Palette. Proceeding region by region, this stunning art book captures both natural and man-made beauty. Townsley, a native of Vancouver and a lifelong photographer, attributes the quality of his photographs to patience and luck. Traveling on foot whenever possible, he returned to places at different times of year to track seasonal changes. British Columbia, the text reveals, has the most plant and animal diversity in Canada, housing seven national parks as well as regional and provincial parks, and human influence feels light outside of cities like Victoria. Townsley’s gorgeous full-color images present far-reaching vistas but also close-up minutiae. The book opens with a helpful map and relevant facts about the province, and each chapter introduces a particular area of British Columbia. Photographs are accompanied by succinct informational captions explaining the geological features, weather phenomena, or species depicted; fun trivia is also offered. Although his sweeping landscape shots—of Siwash Point and Lake O’Hara Basin, for instance—are particularly glorious, Townsley is equally skilled at drawing the eye to tiny scenes others might miss: unfurling fiddlehead ferns, starfish and anemones in tidal pools, hoarfrost, moss on a red cedar, and runoff patterns on a beach. The excellent watercolors are difficult to tell apart from photographs: they are just as precise. That attention to detail is also clear in the book’s careful layout. Two-page spreads are arranged such that the images’ colors complement each other, with the pink of foxgloves picking up on shades of the sunset on the facing page. Even the feature color in the captions is chosen to match the images’ primary hue. Unfortunately, the same meticulousness has not been applied to prose sections and captions, which are marred by fairly frequent subject-verb agreement issues and missing apostrophes. The quality and variety of the book’s images cannot be faulted, however. Close encounters with mammals like mountain goats, a coyote, marmots, bison, and a black bear may be most remarkable for some, but the diversity of birds, seaweed, and flowers is equally impressive. The occasional action shot, like one of bald eagles fighting over a salmon, adds excitement. Though primarily devoted to natural beauty, the book also features some notable man-made structures, such as Fort Steele and the Vancouver skyline. Environmentalism is an undercurrent but not a strident message here, with the author revealing how human encroachment can harm wildlife and habitats. British Columbia: Graced by Nature’s Palette gives a real sense of the passing of the seasons and of the province’s diversity of flora and fauna, and all of it well worth celebrating and saving. It will inspire residents and tourists alike to appreciate the beauty of British Columbia.